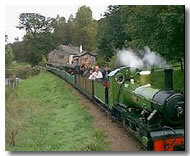 This narrow gauge railway runs some 7 miles up the Eskdale Valley from Ravenglass to Dalegarth and is well worth a visit. Railway details including timetables. A short drive south takes you to Muncaster Castle with its fantastic gardens which are a must to see in the spring. It is also home to the World Owl Trust along with many other attractions at the Castle. 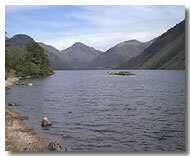 Only a 10 minute car journey from the hotel takes to the unspoilt valley of Wasdale, once voted “Britain’s Favourite View”, take a stroll along Wastwater, England’s deepest lake, marvel at the magnificence of Scawfell Pike—at 3210 feet high it is England’s highest mountain. At the head of the valley take a look inside St Olaf’s Church - said to be England’s smallest church. Should you wish to live closer to the beauty of the natural world about us and have a more independant/self catering stay there is an excellent camp site less than 1 mile from The Victoria Hotel at Shepherds Views. They have both caravan and camping pitches available at very reasonable prices and also have 3 very well appointed self catering cottages available, please contact Julie and Stephen Shepherd directly on 019467 29907 for more details. We also get good reports from the Fisherground campsite in Eskdale, the Camping and Caravanning Club site at Ravenglass and the Old Post Office campsite at Santon Bridge. Right next to the Victoria Hotel, located inside the former railway station buildings you will find a quaint and traditional craft shop, Spindlecraft. Here you can peruse among a fine selection of local crafts, fine clothing and other gifts to take home as a reminder of your visit to the area. You can also relax here a while over a cup of coffee or tea while deciding on what to purchase.